How do substrate failures affect epoxy floors? There have been many times where I have been called to take a look at a delaminated epoxy floor (see the picture above). Most people rush to conclusions on why the epoxy floor started chipping: maybe there was humidity in the surface, or the surface had not been properly prepared, or the surface had not been primed properly. All these are just a few of the plausible explanation on why the floor failed. 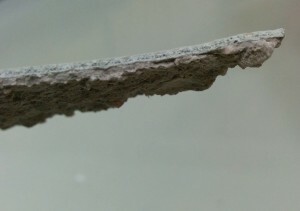 However as we notice in this specific example (see picture below), the coating did not dis-attach from the substrate. Instead what we are seeing is the substrate breaking. In this case the substrate was composed of poor quality cement that simply was not strong enough to support the wear and tear that this particular floor was being exposed to. As a result the substrate gave way and this in turn led to the epoxy coating on top to break. This is why it is always very important to consider the substrate that you are working on before you go to work on a new floor. Make sure that the substrate will be able to withstand the forces that it will be subjected to. 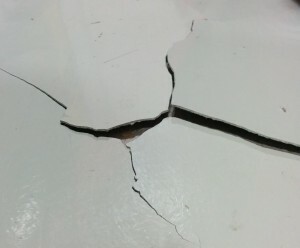 A thin floor coating will not necessarily fix a weak substrate.